The team at Achievement Products® asked our consultant, Occupational Therapist Scott Russo, to provide some activity suggestions for incorporating some of our favorite items into daily classroom activities or curriculum. Scott has provided some really great and creative ways to use items (that may have been originally designed for typically developing children), in special needs environments. Today we will look at the Tactile Sensory Ball. The tactile sensory ball is an excellent tool for the development of balance, core strength, and vestibular and proprioceptive stimulation with the added benefit of increased tactile input. This ball is perfect for the child or teenager who is challenged by an under-regulated sensory system or overall decreased body awareness. The ball is a normal therapy exercise ball with hundreds of sensory bumps which increase the awareness of both the ball and the body during activity. All activities should be engaged in with a caregiver or teacher in attendance. Develop static (non-moving) and dynamic (moving) balance skills. Start by having the child or teenager simply try to maintain their balance while their feet are on the ground. Move the ball in different directions and have the child adjust their balance accordingly. Start with slow movements and gradually increase to more challenging movements. Have the child or teenager sit on the ball and try to maintain balance with their feet off of the ground. Lying on the belly, have the child perform wheelbarrow walks. Make sure their legs are together and supported as they walk forward and backward on their hands. To increase upper-body strength, have students try pushups with their feet or legs supported by the ball. The pushups can be graded by having less and less of the leg supported as the child or teenager walks out on his/her hands. From a sitting position, have the child or teenager perform situps while maintaining their balance, have them lean back as far as they can support themselves, or with a spotter supporting them, then bring themselves back up to a sitting position. Use the ball as a chair for increased attention. The ball can be used at a desk or table during fine motor or academic tasks. Use the ball as a balance challenge for gross motor play such as balloon volleyball or catch. For the teenager, there are a variety of resistance activities that can be done using the ball as the balance device while performing normal weight training movements. For increased sensory input, have the child or teenager lie on his/her belly and use the ball as a roller, applying pressure over the back. For more information about the Tactile Sensory Ball and other great items please visit http://www.achievement-products.com. The team at Achievement Products® asked our consultant, Occupational Therapist Scott Russo, to provide some activity suggestions for incorporating some of our favorite items into daily classroom activities or curriculum. Scott has provided some really great and creative ways to use items (that may have been originally designed for typically developing children), in special needs environments. Today we will look at the Music Blocks. For more information about the Music Blocks and other great items please visit www.Achievement-Products.com. The team at Achievement Products asked our consultant, Occupational Therapist Scott Russo, to provide some activity suggestions for incorporating some of our favorite items into daily classroom activities or curriculum. Scott has provided some really great and creative ways to use items (that may have been originally designed for typically developing children), in special needs environments. Today we will look at the Squeeze and Feed Frogs. The simplest activity is to have the child squeeze the frog and place the bugs inside the mouth with their other hand. Have the child place his/her thumb on one side of the frog’s mouth with the other four fingers on the opposite side forming a cupping of the palm when squeezing. To increase the challenge, have the child try to pick up the bugs using only the frog and not their other hand. Play a game using the die. 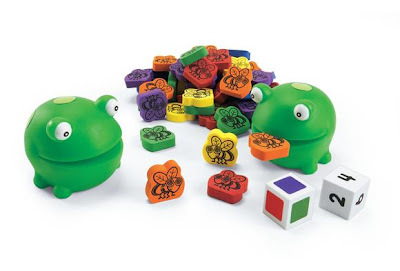 For younger children, use the color die and have them race to get as many of the colors as they can into the frog’s mouth. For school-aged children, have them use the number die for number recognition. To increase the challenge, have the child use both dice and see if they can pick up the correct of number of the correct color. Develop social skills. Have the child use the frogs for conversations. Have the child make the frog talk by squeezing and releasing the mouth. In a small group with two children, or a simple 1:1 adult/child situation, the frogs can have a conversation with each other. To develop bilateral integration skills, use one frog to pick up a bug and have it feed the bug to other frog. The team at Achievement Products asked our consultant, Occupational Therapist Scott Russo, to provide some activity suggestions for incorporating some of our favorite items into daily classroom activities or curriculum. Scott has provided some really great and creative ways to use items (that may have been originally designed for typically developing children), in special needs environments. Today we will look at the Toppletree. Introduction:Toppletree is a fun and challenging fine motor game. Starting from the base, players try to build a branch of the tree with four consecutive color pieces without toppling the tree. The game requires fine motor precision as the child must use muscle coordination to grade his placement of the pieces without toppling the tree. This game also assists the child in the development of planning and reasoning skills as they must be able to see how to get to their piece in the correct order while not compromising the tree’s balance. For more information about the Toppletree and other great items please visit www.achievement-products.com. The team at Achievement Products asked our consultant, Occupational Therapist Scott Russo, to provide some activity suggestions for incorporating some of our favorite items into daily classroom activities or curriculum. Scott has provided some really great and creative ways to use items (that may have been originally designed for typically developing children), in special needs environments. Today we will look at the Gel Spiral Pad. The team at Achievement Products asked our consultant, Occupational Therapist Scott Russo, to provide some activity suggestions for incorporating some of our favorite items into daily classroom activities or curriculum. Scott has provided some really great and creative ways to use items (that may have been originally designed for typically developing children), in special needs environments. Today we will look at the Balancing Hat. The Balance Hat is a fun way to work on body awareness, gross and fine motor control, social skills and pre-academic skills. The lightweight foam pieces provide comfort when it is worn as a hat, safety if/when it is dropped, and ease of use due to the light-weight and easy grip material. The different colored and sized pieces allow for a wide range of pre-academic categorization options. Simple stacking activities. Have the child use the “hat” as a simple stacking activity without putting it on his/her head. Discuss the sizes, shapes and colors of the blocks while the child familiarizes his/herself with the “hat”. Other relay ideas: the teams must first work together to create the stack in the correct order on the table. Then each team member takes a turn wearing the hat while walking a fixed distance. The hat must be passed between teams members as a baton would be in a relay race. The team at Achievement Products asked our consultant, Occupational Therapist Scott Russo, to provide some activity suggestions for incorporating some of our favorite items into daily classroom activities or curriculum. Scott has provided some really great and creative ways to use items (that may have been originally designed for typically developing children), in special needs environments. Today we will look at the Button Bear Weighted Lap Pad. Providing both a weighted lap pad and a bear with several different options for developing dressing skills, the Button Bear Weighted Lap Pad is perfect for developing the fine motor skills needed for buttoning, zipping, tying, and additional dressing skills while providing the option of a weighted lap pad for improved sensory regulation. The detachable bear allows the pad and the bear to be used separately or in conjunction with each other. The colorful and charming nature of the bear provides a naturally engaging dressing toy that will entertain children for extended periods. The fabric was also designed to assist with tactile processing skills, providing several different textures that should be pleasing, even to the tactile defensive child. • Add the weights into the pad and place the pad on the child’s lap during classroom or community activities that require a child to maintain a seated position or long periods of focus such as circle time, church, car rides or dining out. The weighted nature of the pad will provide proprioceptive input and the bear will provide fidget toys, both of which should assist the child with self-regulation and attentional focus. • The bear is attached to the pad with hook and loop. Have the child pull the bear off the pad and reattach. This exercise will help develop strength in the hands and arms and also improves motor planning. • Place the pad (with or without weights) on the child’s lap with the bear’s feet facing the child’s belly. Experiment with the different dressing items. • Switch the orientation of the bear so that the head is against the child’s belly and experiment with dressing from this direction. The change in orientation will provide a different challenge for the child but is also closer to the perspective of dressing themselves. • Have the child remove the bear from the pad. Using just the bear, the child can engage in pretend play with the bear as if it were a typical doll. • With the bear removed, the pad can be used as a regular weighted lap pad for proprioceptive input. • The bear itself can also be used as a portable and socially appropriate fidget toy for holding attention and self-regulation. For more information about the Button Bear Weighted Lap Pad and other great items please visit http://www.achievement-products.com/Default.aspx?src=logo.